17 Greatest Hits was released in 1985 on Columbia Records. 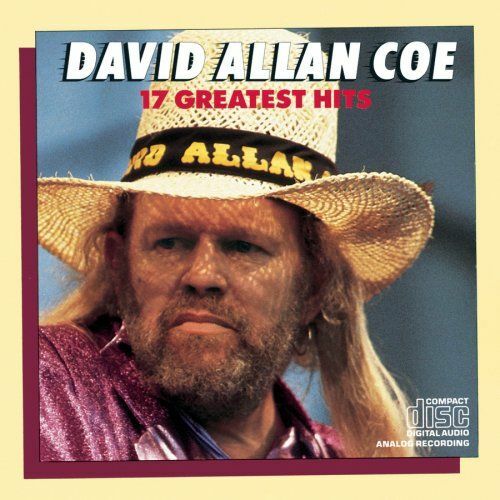 David Allan Coe’s 17 Greatest Hits was digitally remastered by M.C. Rather & Hollis Flatt (Custom Mastering, Nashville, Tennessee). The 17 Greatest Hits CD is the most thorough retrospective assembled of David Allan Coe’s outlaw heyday, containing every one of his greatest hits — including “You Never Even Called Me by My Name,” “The Ride,” “Mona Lisa Lost Her Smile,” “Willie, Waylon and Me,” “Longhaired Redneck,” and “She Used to Love Me a Lot” — plus a bunch of minor hits and lesser-known tracks. Produced by Billy Sherill, Ron Bledsoe, David Allan Coe, Waylon Jennings.